The informative novel My Soccer Book by Gail Gibbons is a book about soccer and what it consists of. However, the book generally doesn’t tell a story but gives readers information of what players wear, what a soccer field contains, how many players on a team, and how soccer is played. Each picture on the page supports the text and uses vocabulary words to create an understanding for readers. The informative novel was able to expand the reader’s awareness by letting them take a look into the world of soccer. By getting the perspective with use of pictures, the reader is able to learn about soccer. For example, in the novel there is a picture of a soccer field with labels of the field such as penalty area, goal, sideline, and center line. However, the reader is unable to give empathy because there is not specific plot or characters. The novel provides an enjoyable read that doesn’t teach a moral because it is more to inform readers about soccer. Furthermore, the novel tells the truth of what soccer consists of by using accurate insight but there were not characters in the story. The novel meets the criteria of embodying qualities because the description of soccer is telling by use of precise and descripted words. The plot is convincing because it explained exactly what happens during a soccer game such as how many players on a team. However, there were not characters in the story but there was picture which can be believable soccer players. Furthermore, the novel has integrity because it brings the literature works into making a satisfying whole. Finally, the informative novel meets the criteria of being original because it creates a fascinating viewpoint for readers. Also, it was able to give readers a new way of thinking about what soccer consists of as well as looks like with use of multiple vocabulary words.I didn’t enjoy the informative novel because it didn’t tell an interesting story that caught my attention. The book not telling a story struck me because I expected it to have an interesting story line about soccer. However, the story is relatable to my life because as a child I played soccer. Furthermore, I would use the novel in my classroom by tucking it way in the bookcase where students can view the book on their own time. The book "My Soccer Book" by Gail Gibbons is a very good informative book. This book provides information about the game of soccer on every single page. A child could read this book and have a very good idea about how the game of soccer works. This book was a very informative read. The book was very accurate on how the game of soccer works. This book explained everything about soccer from what you wear to the positions on a soccer team. The information was presented in a very organized way. The book starts with very basic information like the types of uniforms you usually wear when playing soccer to the field positions on the soccer field when playing soccer. The format of the book and design is very appealing to children. The use of brightly colored pictures that go along with the text seem to draw children in to read this book. The authors writing stly os very clear and promotes enthusiasm for this topic. The author accomplishes this by the use of short easy to understand sentences and pictures that go along with the text. I really enjoyed reading this book. I seemed to be drawn in with interest as I kept on reading. One thing that struck me about this book was the glossary in the back of the book with words that deal with soccer that children may have a hard time understanding. I can't really relate this book to my life due to the fact that I don't play soccer. To a soccer player this book would be a great tool though. I would use this book in a class setting if I was teaching a gym class the game of soccer. I would read the students this book before we play the game so they get a good idea about how this sport works. 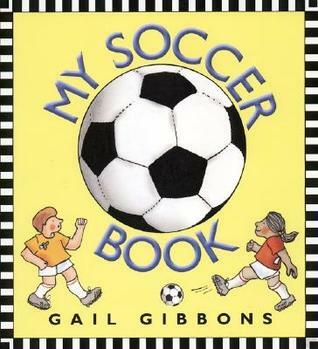 Book Title: My Soccer Book by Gail GibbonsDescription: This book provides all the basics to soccer: markings on a soccer field, what soccer players wear, the positions, etc.Focus: The different details found inside the book: labels, pictures, and diagrams. Teach: RL.1.7 Use illustrations and details in a story to describe its characters, setting, or events. a. Read the bookb. Discuss how authors can add more details to their books by adding pictures and labels. It is important that your audience know and understand what the author is writing about.c. Students will review book and point out labels, diagrams, and pictures that follow the text.d. Students will revisit writing folders and choose a piece to go back and add pictures, labels, and diagrams. e.	ModelExpected Outcome: Students will be able to strengthen their writing by adding details to their pictures. They will realize that illustrations are another way to add details to their writing. Gail Gibbons - From gailgibbons: I was born in Oak Park, Illinois, in 1944. Even as a little child, I was always busy putting books together. Sometimes I would bind them with yarn to hold the pages together. I've always loved drawing and painting. I was also a very curious child. My parents tell me that I was always asking lots and lots of questions.Later, I went on to the University of Illinois, where I studied graphic design. Then I moved to New York City, where I got a job doing artwork for television shows. Eventually I was asked to do the artwork for a children's show. While doing that show, some of the children asked me if I had ever thought of doing children's books. My mind immediately recalled how much I enjoyed doing that type of thing when I was a child. So I put an idea for a book together and right away a publisher bought it. That book was called Willy and His Wheel Wagon. Since then, over 170 books that I have written and illustrated have been published. The type of books I write are non-fiction books. This is because I love researching so much. I get to ask lots of questions, just like when I was a kid. I also get to travel and meet lots of interesting people. While doing research for my book Nature's Green Umbrella: Tropical Rain Forests, I traveled to two islands where there are tropical rain forests, Saba and Dominica. I also had a great time writing and illustrating the book. I get a lot of pleasure from doing the type of work I do.